Colgate’s inaugural residential commons, which opened its doors on Arrival Day 2015, will be named for Diane Ciccone ’74, P’10. Commons residents made the choice by popular vote after reviewing a slate of important names in Colgate’s history. 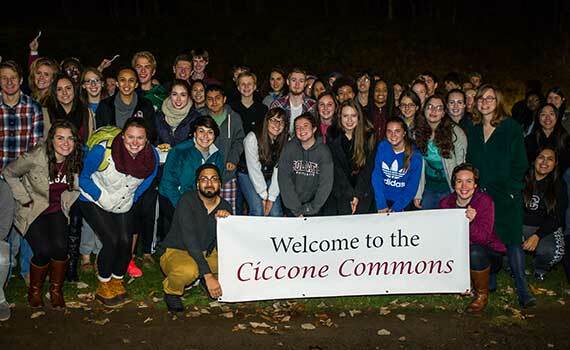 Ciccone is a member of the first class of women to graduate from Colgate. After earning her JD from Hofstra University in 1977, she went on to a career in law and journalism. She also became a passionate advocate for the Colgate community, both current students and her fellow alumni. A founding member of Colgate’s Alumni of Color organization, Ciccone served on both the alumni council and the university’s Board of Trustees, chairing its legal affairs and insurance committee. 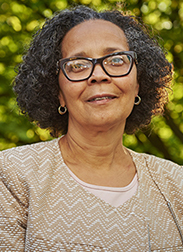 She has mentored generations of undergraduates via the Sister2Sister program and career services, and she has supported the ALANA Cultural Center, establishing a library of books by authors of color. In 2014, she received the Wm. Brian Little ’64 Award for Distinguished Service. Read more about Ciccone in her award citation. The Ciccone Commons is the first of four residential commons that will open during the course of the next several years. The commons system represents a new approach to “living the liberal arts” at Colgate. Led by faculty directors, residential commons students not only live and enjoy free time together, they take classes and study side by side, integrating academic exploration into their daily experiences. Sophomore, junior, and senior members will play a crucial role in commons activities, and they will have the opportunity to live in commons annexes, located on Broad Street. The selection of Ciccone will serve as a prototype for future name selections. Each new residential commons will hold an election to choose a moniker based on important characters in Colgate’s story — individuals who, like Diane Ciccone, have demonstrated courage in the face of adversity and made an impact on the community.